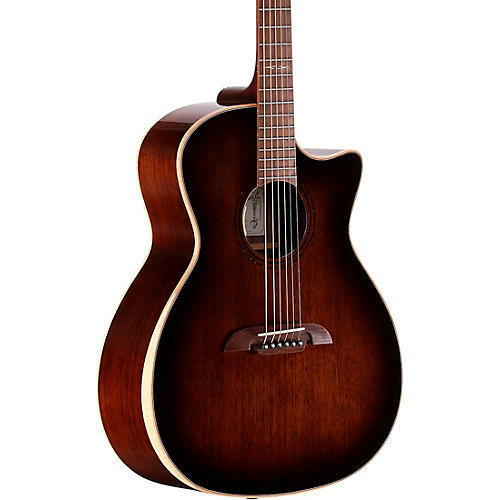 The AGW770CEAR Grand Auditorium acoustic-electric guitar is a premium Artist Series guitar made from the finest materials that displays Alvarez’s renowned high gloss, fine finish over a beautiful solid black walnut top. The AGW770CEAR's flamed maple binding runs into a slim bevel armrest creating comfort while you play and a high-end feature to enjoy aesthetically. Tonally, the AGW770CEAR has the articulation a Grand Auditorium can offer with a little more emphasis on the trebles. Being made of walnut, the projection is nicely harnessed with a really quick response, which produces a more focused projection and fewer overtones, making this guitar a great choice for recording and live work. To make an acoustic-electric, the AGW770CEAR is fitted with the discrete, but lively, SYS100 pickup and preamp which is located in the endpin and controlled by a smartly designed soundhole console offering volume and tone controls. Overall, this guitar is a premium quality instrument offering amazing value, with a sophisticated voice and stunning aesthetic. After 50 years of making guitars, continual improvement through the use of emerging technologies, processes, and materials is still at the heart of Alvarez culture. Alvarez guitars are constructed correctly in every sense, from raw material preparation to construction and manufacturing processes. Their tonewoods are carefully cured; components such as neck blocks and wood joints are carefully designed. The painting, sanding and polishing techniques used are continually researched and developed, and the tone is impeccably crafted and married to a stable, consistent and lively sound box. Nontransferable limited lifetime warranty on guitars. Check with manufacturer for specific parts and labor warranty.